This book tells the story of the American flag through poetry, history, and beautiful illustrations. Each spread gives a short poem and information about a different aspect of the flag. There is information about the design and making of the flag, the different places it is flown, and the people who live under it and have fought for it. Written on different levels for different readers, it is adaptable for children from preschool through elementary school. 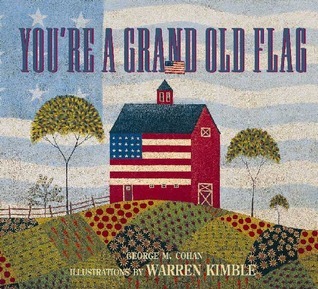 The text of this book are the lyrics to George M. Cohan’s song ‘You’re a Grand Old Flag’ written in 1906. Warren Kimble pairs the lyrics with patriotic scenes in an old Americana style. The book is easy to sing along with, and provides excellent artwork to accompany the music. At the end of the book, you can find information about the song and about George M. Cohan, songwriter for ‘Yankee Doodle Dandy’ and ‘Over There’. 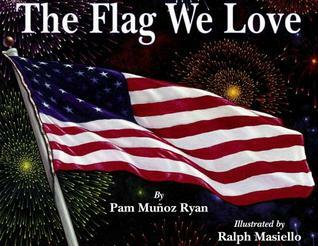 Then there is also a page with directions on how to make a Grand Old Stars and Stripes Windsock as well as more books to read to learn more about the flag including The Flag We Love by Pam Munoz Ryan (above), and some websites to search for more information. 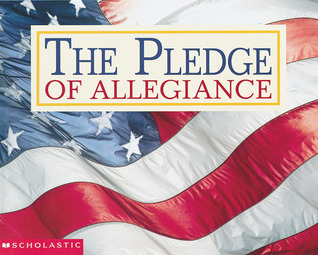 The words to the Pledge of Allegiance, written in 1892 by Francis Bellamy, are the text to this picture book. They are accompanied by relevant and patriotic photographs of the United States of America. There is also some historical information to help children understand the meaning behind the words we say when we pledge our allegiance to the flag of the United States of America.